The road to Peters Creek passed numerous pond-filled meadows that reflected the majestic Denali mountain range. We eventually reached a stand of alders with several campers occupying the more desirable spots. One friendly alaskan directed me to a rough campground that had been overlooked by the others. 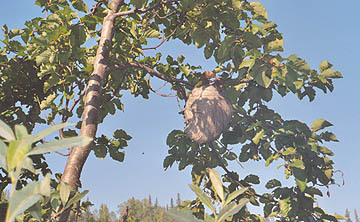 It was perfect - with alders providing shade from three sides and the river in front. I leveled the SUV by the fire pit and was unpacking the rear when I heard a shout. I looked up and couldn't believe my eyes. There was a look of terror and panic on Alex's eyes as he raced towards me waving his arms and screaming. "Quick, over here", I shouted, grabbing him from behind and tossed him into the Explorer, shutting the door with a bang. The hornets had exacted their punishment by then, however, and we sat inside examing his wound. Poor guy! 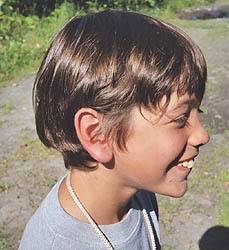 The entire ear swelled and turned red in minutes. I told him it had the color and consistency of a small pizza. Needless to say we wasted no time moving to a different campsite. Peters Creek is one of those broad, shallow freestone rivers I have grown to love over the years. With the air temperature in the upper eighties it was so refreshing to wade in shorts and shoes down the middle of the river. The king salmon had already spawned weeks earlier and lay in various stages of decomposition. I across a scarred old male with rotting fins laying on his side behind a protruding rock. There was no movement from the battered king save for the gill plates - which still pumped oxygen rhythmically. But we came here for rainbows and rainbows we caught. I had wondered on the Kenai why anglers bothered with rainbows when salmon three times their size seemed to be everywhere. I got my answer at this wonderful river. There weren't many of them and you had to wade considerably between spots. They preferred the depressions alongside the boulders found at the head of runs. They had been feeding on salmon spawn recently and were very responsive to egg imitations. About a mile below the campground we encountered a series of boulders with the main current pinched between them. I hooked a nice rainvow there that went airborne immediately. A few more vaults and then the line screamed off the reel. It ran downstream past the rocks with greyhound leaps leaving me with a flyline draped over the exposed rocks. I stumbled in pursuit, but as I got a direct line to the fish it started another run. This one crossed the entire pool to the fast water below and took all of my line and about half of the backing, a distance of close to 100 yards. When it was all over we shot the picture you see and gently released the fish. We caught several of these beauties during our stay. 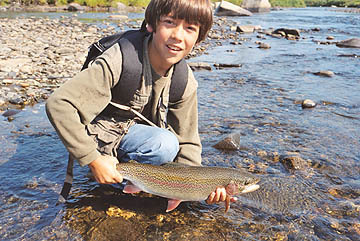 I tried to recall a more spirited trout from all my Montana and Idaho memories and couldn't come up with any. Alaska rainbows are truly remarkable. But our day was not over. On our way back we came upon a salmon hole that lacked trout but was full of rising fish. What could they be? I change my leader and tied on a #16 elk hair caddis. 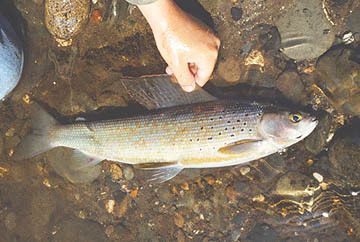 I caught a grayling on my first cast ... and the second ... and the third ... and the fourth. Well, you get the idea. Eventually they did stop taking our flies and we moved on back to camp. I was too exhausted to cook dinner that evening and we treated ourselves to hamburgers at the restaurant/bar/motel/grocery story up the hill. An old log building with a gigantic moose rack inside and a wolverine pelt stretched on the wall. We just sat back in our chairs with our cokes in our laps and took it all in.